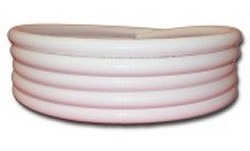 3/4" FlexPVC® Flexible PVC Pipe 1.050" .786 100 psi 400 psi 2" 28"
3/4" EZ-Flow Flexible PVC Pipe 1.050" .850" 60 psi 355 psi 5.5" 28"
*Can vary +/- 5% from pipe to pipe. 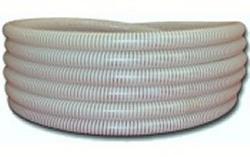 **This flexible schedule 40 PVC pipe is de-rated for temperatures over 73F. See the de-rating chart on the PVC Pipe Dimension and Pressure page. ✝ Yes, the standard flex has a smaller bend radius than the EZ-Flow Thinwall flexible pvc pipe. If you bend the EZ-Flow Thinwall too far it'll kink because it's thinner wall. Standard flexible pvc pipe will bend tighter, but you'll need more force to do it. Read about our LIFETIME LIMITED WARRANTY! MADE IN THE USA, not like the imported junk that will spring holes in a couple of years. 500ft x 3/4 inch GRAY FlexPVC® brand flexible PVC pipe.